Before there was a public swimming pool in Bellaire, many people swam in the Ohio River. There was a public beach not far from the Interstate Bridge that was used for swimming. There were also some public boat docks that used to be near this area. Several drownings in the Ohio River lead to the consideration of a public swimming pool in Bellaire,Ohio. The Bellaire Swimming Pool was constructed in 1940 by the Works Progress Administration created during Franklin Delanor Roosevelt's presidency. The money for construction of the pool was donated in 1936 by James F. and William Mellott. The brothers contributed $10,000.00 through the Bellaire American Legion Post so they could use WPA funds. These were the same brothers who gave the money for the Mellott Memorial Building in which the Bellaire Public Library is now housed. The pool was one of 45 built by WPA workers in Ohio. Steam shovels excavated the area. Construction started in 1939 and finished in 1941. On Memorial Day in 1941, the pool was dedicated to the city. The first person to use the pool was Richard Tobin of Bellaire, who later became a lifeguard at the pool. Other first day swimmers were Jack Tobin and Tino Esposito, who later became mayor of Bellaire. Originally, there was a large water fountain on the shallow end of the pool and a platform just beyond the diving area in the deep end of the pool. A small water slide was later installed in the shallow end. All of these items were taken out at a later time. For many years the Recreation Department of the City of Bellaire ran the swimming pool. Mrs. Flowers was the last Recreation Director. When her position was not funded, the swimming pool almost closed. 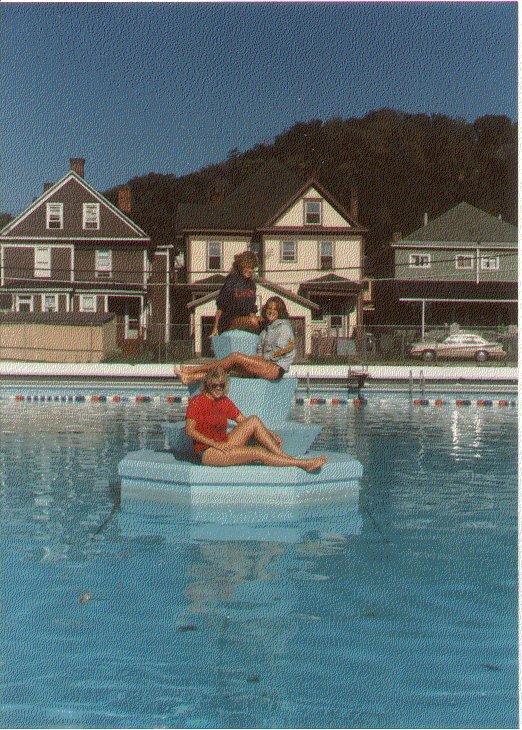 However, the Bellaire Fire Department Association under the direction of President Lou Valloric rescued the pool from closing in 1988. The Fire Department Association ran the pool for several years. Then the city maintained the pool for a few years. More recently, a park district was formed that currently controls the swimming pool and other park property. The original bathhouse developed some cracks in the walls, especially around the filter room, in 1990. A new bathhouse was built about 2 years later at a cost of about $100,000.00. Numerous repairs have been made over the years. One year, in the mid 1990's a driver, who was fleeing from the police, crashed through the fence by the diving boards. He hit the low diving board. The low diving board was the only thing that prevented his vehicle from falling into the drained pool. There has long been a swim team in Bellaire. Members of the swim team competed with other swim teams in Belmont County. The other swim teams are Barnesville, Martins Ferry, and St. Clairsville. Previously there were swim teams at Shadyside and Powhatan Point. Laurie Parker has been head of the swim team in Bellaire for several years. Before her, Bill Dunaway was head of the swim team. The American Red Cross has offered swimming lessons for 46 years at the Bellaire City Swimming Pool. Charles and Clara Dankworth were in charge of the swimming lessons for about 36 years. In recent years, John Kniesner has been teaching swimming lessons. There also used to be a synchronized swim team at the Bellaire City Swimming Pool. Dr. Thomas Ring was in charge of the synchronized swim team for many years. Dr. Ring also donated the rhododendron bushes that were planted near the swimming pool around 1994.The Bellaire Swimming Pool closed at the end of the 2002 season.